As some of you may know I have been going a little sewing-crazy of late. 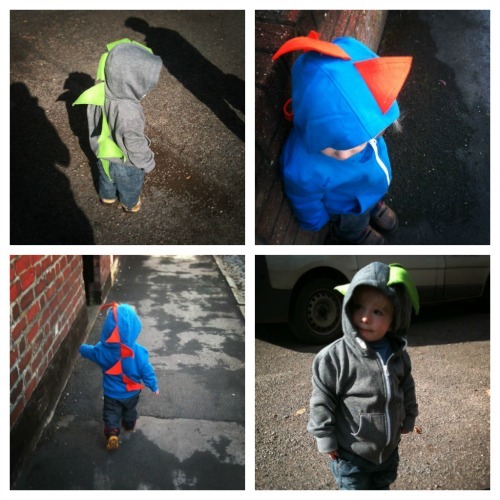 I am still not very good at it but I am really enjoying making fun stuff for W. It all started when I saw this post on Pinterest and I knew I just had to give it a go, and I was amazed at how simple it was to transform a simple top into a super-cute dinosaur hoodie in just three easy steps. First I bought a simple hoodie from Tesco for just £4. I also bought a few felt squares, mine happened to be 30 x 30 cm. Then I began the transformation! 1. 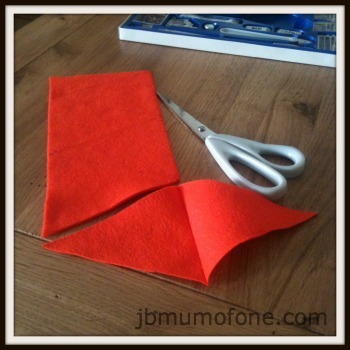 Fold your felt squares in half and iron along the crease. Along one side draw your triangles and cut out. These then unfold into diamonds. 2. 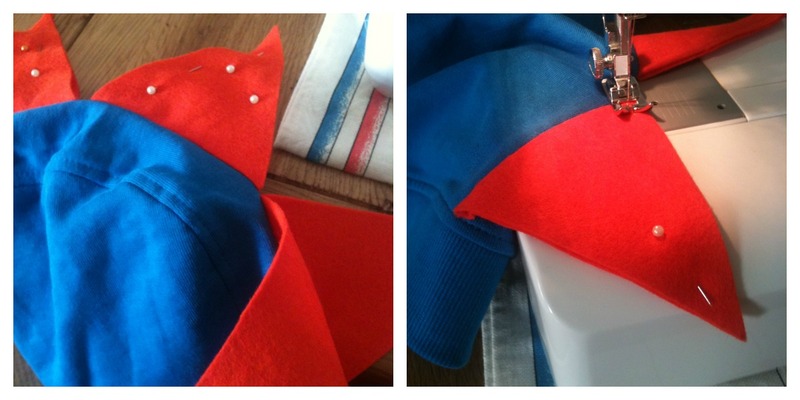 Pin your diamonds centrally along the hood and centre of the back panel of the hoodie. Sew along the centre line. 3. 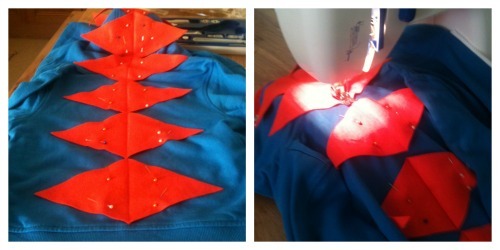 Pin triangles together to form dinosaur spikes and sew. And there you have it, your very own dinosaur-hoodie in just three easy steps! Tip: The first one I made in grey and green and the spikes were approximately 10cm wide by 15cm tall. They are quite floppy. For my second attempt, the blue and orange dinosaur-hoodie, I shortened the spikes to 10cm tall and they do stand up a bit more. If you want them to stand stiffly you could consider backing the felt with something, but as I wanted them to be wearable and comfy to sit back in etc I chose to leave them as they are. If you have any thoughts or questions on how to go about it do let me know below. This is such a clever idea. I really need to get my sewing machine out and have a play around with it. I had honestly not used one since school! They turned out adorable! Well done! And thanks for linking back! I love to see what people do! Oh blimey no thank you! I am so glad that I found your blog and saw the post. I just love pinterest, you discover so much cool stuff there! Blooming love this idea! Officially inspired! Do! They really don’t take long at all, much less than an hour! Fabulous!! I don’t sew but perhaps I will persuade a sewing inclined friend to do one for Milo. I love this idea too. Bibsey is as mad about dinosaurs as she is fairies. But I am so uncrafty… must try harder. great idea – I have a little Oscarsaurus dinosaurus who would love this! I’m going to give it a go! I love this! A kid in my class had this as a dress up costume for World Book Day with added eyes on the hood. This is brill. My girly better be a tom boy or I will need to make one for a friend.